Those who took part in the Gatorade/Steelers 5K are making a difference. As runners crossed the finish line for the 29th Annual Gatorade/Steelers 5K Race, they felt a sense of accomplishment, finishing the 3.1 race either in a personal best time, or in some cases for the first time. They should feel a much greater sense of accomplishment. The race is one of the main fundraising events for the Art Rooney Scholarship Fund, carrying on the memory of the late Steelers’ owner Art Rooney Sr. Three graduating seniors from North Side high schools, one from Cardinal Wuerl North Catholic and two from Perry High School through the Pittsburgh Promise, are awarded a college scholarship, helping them with the ever rising cost of education. Serventi, who will attend Robert Morris University and study actuarial science, grew up a Steelers fan, so receiving a scholarship from his favorite team is a bit overwhelming for him. “It’s exciting,” said Serventi. “If you grow up in Pittsburgh, you grow up a Steelers fan. I played football growing up. To have them give me scholarship money, it’s crazy to think about it. 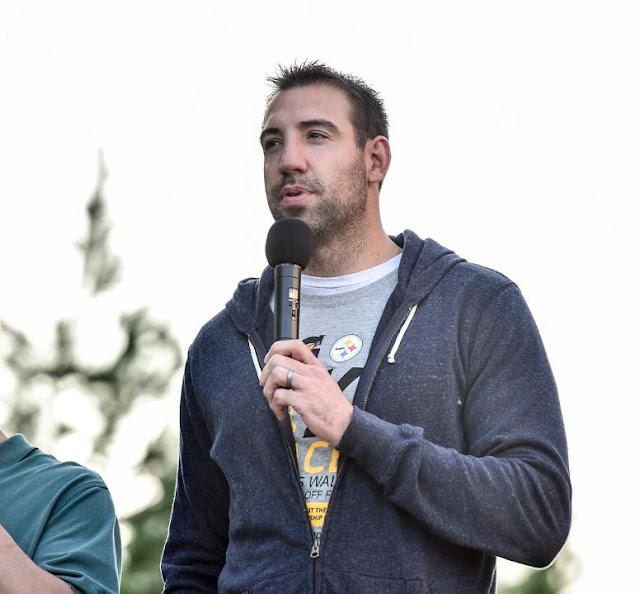 Matt Spaeth, who played for the Steelers from 2007-210 and 2013-15, served as the honorary captain for the race. It was an event he heard about as a player, but didn’t realize the impact it had until now. And it doesn’t surprise him.